Baking and Cooking, A Tale of Two Loves: Carrot Cake Cupcakes with Cream Cheese Frosting and I met "Stef" from The Cupcake Project! Carrot Cake Cupcakes with Cream Cheese Frosting and I met "Stef" from The Cupcake Project! How would feel if you got to meet your your hero, mentor, or favorite rock star? I got to meet "Stef" the author of the famous, blog, The Cupcake Project. 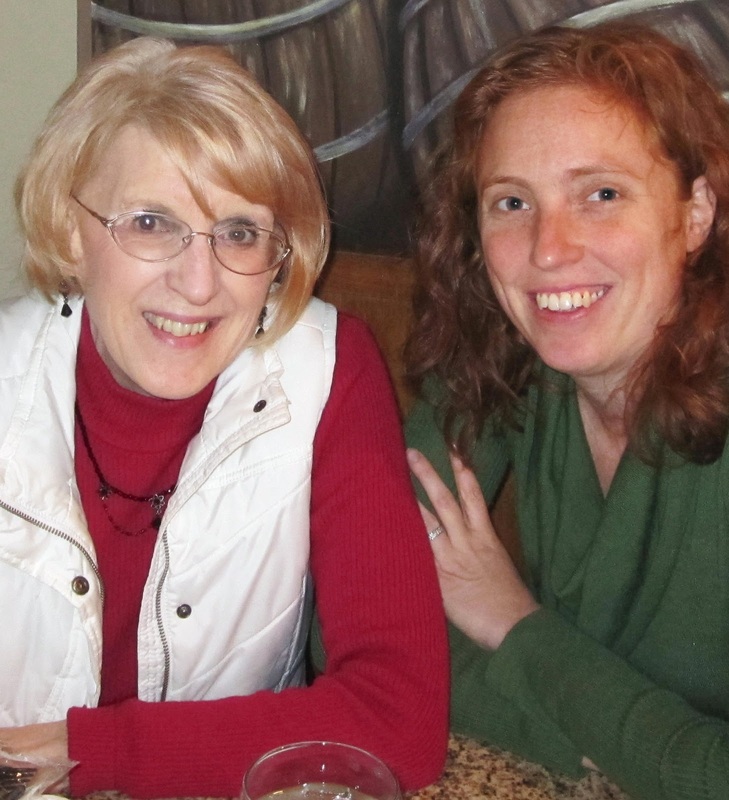 in St. Louis, when I went to see my granddaughter last week, and I was so excited. Even before I started blogging, I began to read her blog, and fell in love with cupcakes. Her blog continues to inspire me and makes we want to be better blogger. I had tried to meet Stef before on previous trips, but it never worked out until last week. We met at a little restaurant in the St. Louis Area, and had a very nice lunch. Stef is a very busy woman, juggling a photography business with her husband, having a very popular food blog, and a Mom of a 16 month. old son. I marvel at all of you women out there juggling so many things. For all of you "cupcakers" out there you will recognize her from her blog.and her many awards and accomplishments. To name a few, she has been in People magazine, writes cupcake recipes for Paula Deen, On Fox 2 News, mentioned in the NY times, and many others, to numerous to mention. Her blog is totally cupcakes or cupcake related items 24/7, and the amazing cupcake combinations that she creates. Go on over and check out here blog and the amazing cupcakes that she makes, if you haven't already done so. In honor of Stef, I made her Carrot Cake Cupcakes with Cream Cheese frosting with a few modifications I didn't have any cardamon, so I just added another 1/2 tsp. of cinnamon. I also didn't have a coconut to desicate, or coconut oil. I just used regular coconut in a bag and vegetable oil for the coconut oil., and added raisins. Otherwise they are just like Stef's:) You may wonder why I'm making Carrot Cake Cupcakes in the dead of winter. Well, I got a new food processor for Christmas, so I grated the carrots with the processor, so easy, These cupcakes are so moist and flavorful with the coconut, carrots, raisins, and cinnamon. Enjoy! How wonderful that you got to meet her. Great picture too! These sound and look so great. Wonderful post! Brandie- It was like I met the Rock Star of Cupcakes! These cupcakes are very good! Becky how wonderful. I bet you were so excited. I like how you adapted her recipe. Have a great weekend. Gina-Thanks, Gina! Have a great weekend, too! I came to your blog from Gingerbread bagels and I'm already sold on your first recipe! I love carrot cake and anything cream cheese frosting is perfect in my book! Looking forward to reading more! Hi Becky...what a great opportunity! Isn't it wonderful to meet our heroes/inspirations? I love that you baked my favorite cake variety too. Bring on those carrots! Thank you for sharing yet another great recipe. I hope you have a great weekend! I'm ready for some rest and baking! the cup cakes look great- bookmarked it! That is awesome Becky that you met Stef..And cupcakes look mouthwatering! Yum! Becky your cupcakes look amazing! I don't bake cupcakes at all, never have. I'm still terrified at how I would stuff up my frosting, lol it will never look as pretty as yours. I think I will stick to savory dishes, lol. Megan- Thanks for stopping by my blog and your kind words. Suchitra-thank you for your kind words. Sandra- I was very excited to meet Stef! Kimberly Peterson- I had never piped frosting until my food blog, last April. I'm still not that good, but I keep trying. If I can do it, you can do it. These look delicious and sooo irresistible! 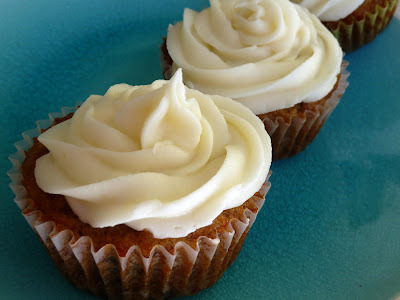 I just love carrot cake, sometimes I think especially because of cream cheese frosting! Your sweet little cupcakes look positively delicious! Carrot cake and carrot cake cupcakes are simply my #1 favorite. That swirl of cream cheese frosting looks amazing! Hello Becky, I have little blog award for you at my blog! Carrot cake always is a treat. Love these little cakes, and I will check out Steph's blog. Isn't it fun to meet up with a fellow blogger?? Nicely done, Becky! Hope you are not too cold! I was thinking about you guys today! Deanna-Thanks for stopping by my blog and these cupcakes are yummy! Dimah- Thank you for your comments! Chef Dennis- i love carrot cake, too. Sara- Thanks for your kind words. Kim-I did have a lot of fun meeting Stef. It was 15 yesterday but felt like 5 degrees above! We're ahving a Heat wave today, 29 degrees above zero. Raspberry Dark Chocolate Bars for a Cause!